This was a great find for my wife and I. We left our motel and started driving to find a place to eat breakfast. You can happen on some of the best places by driving through small towns. The cafe isn’t large but can seat about 35 plus. A rustic, but modern look, mismatched antique tables, sandblasted original brick walls, the menu is written on 3 large chalk boards. Great display of home made muffins, brownies and scones. My wife had the Challah french toast with fresh fruit and cinnamon whipped cream & Vermont maple syrup. The plate presentation was a good as the food. 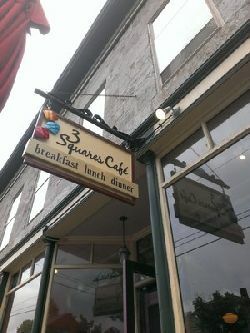 I had the egg panini with home fries, Swiss cheese & sausage. Good sandwich! The coffee is great had about 4 or 5 choices, self service. I don’t mean convenience store self service, I mean nice layout, choice of mugs, creamers, sugars. We at about 9:00AM and the customer traffic in and out was very good.